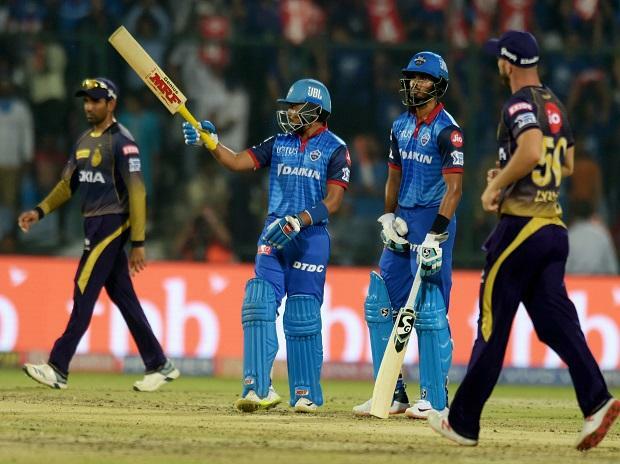 In Match 10 of the VIVO Indian Premier League 2019 (IPL 2019), Delhi Capitals defeated Kolkata Knight Riders by 3 runs in the super over in the most thrilling encounter so far in 12th edition of the tournament at Ferozshah Kotla ground in Delhi on Saturday. Batting first, KKR put 185 runs on board in tehir 20 overs. In its reply, DC also scored 185 runs in their 20 overs with a splended batting show by Prithvi Shaw who missed his century by just 1 run. Prithvi Shaw was names Man of the Match for his 99 runs in 55 balls wit the help of 12 fours and 3 sixes. The match went for super over was DC needed 2 runs off the last ball but their batsman, Colin ingram was run out on Russell's throw before he could complete the second run. The scores were equal for both the teams that meant the result had to be decided on super over. Delhi Capitals batted first with Rishabh Pant and Shreyas Iyer facing Prasidh Krishna, DC managed 10 runs off the super over with a four by Shreyas and two quick doubles by Pant. For KKR, captain Dinesh Karthik and Andre Russell came to bat, Kasigo Rabada took the over, he was hit for a four on the frist ball but he bounced back with a yorker and on the third ball, removed Russell's middle stumps, Robin Uthappa came next but he could not hit much, Karthik also hit a single and jsut 1 run came off the last ball, Rabada's point-precision yorkers saved the day for Delhi Capitals and earned them two points at Feroz Shah Kotla. Earlier, Andre Russell endured a beamer blow but still produced a blistering knock to lift Kolkata Knight Riders to a fighting 185 for 7 against Delhi Capitals. Russell smashed 62 off 28 balls and shared a crucial 95run stand with his skipper Dinesh Karthik (50 off 36 balls) for the sixth wicket. Lamichhane, who had given only 12 runs in his three overs, ended his quota with an expensive over with Karthik and Russell creaming off 17 runs.